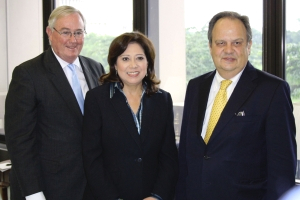 Secretary General Spencer Oliver, US Secretary of Labor Hilda Solis and President Joao Soares in Washington. WASHINGTON, 16 June 2010 – President Joao Soares today appeared before the United States Helsinki Commission (Commission on Security and Cooperation in Europe), stressing the need for greater transparency and accountability in the work of the Organization. During the two-day Presidential visit to Washington, DC, the delegation, which also included Secretary General Spencer Oliver, met with a number of high-ranking officials. In a meeting with Hilda Solis, the Secretary of Labor and former officer of the OSCE Parliamentary Assembly, Mr. Soares and Secretary Solis discussed possible co-operation on issues related to labour practices and particularly combating child labour, and in a meeting with Steny Hoyer, the Majority Leader in the House of Representatives expressed his full support for the work of the delegation and the Assembly. President Soares also met with the Chairman and Co-Chairman of the Helsinki Commission, Senator Ben Cardin and Representative Alcee L. Hastings respectively, to discuss current issues related to the Assembly. In his remarks to the Helsinki Commission, President Soares applauded the work of the US delegation to the Assembly, noting that active American participation has been critical to the success of the OSCE PA. He emphasized the role of the Assembly as an important forum for debate on topical issues and his own efforts to ensure an appropriate balance in the work of the Organization between ‘East’ and ‘West’ of Vienna. The President expressed serious concern about recent unrest in Kyrgyzstan and stressed that the OSCE needs to lend all its efforts to help the country overcome the present crisis and return to the path towards improved democracy. The President highlighted the important work being conducted by OSCE parliamentarians in the field, including by Special Representatives and Ad Hoc Committees, as well as by their active leadership role of election observation. Parliamentarians, he said, have personal legitimacy that ensures the necessary independence to maintain credible and effective observation of electoral processes. President Soares encouraged forward-thinking in terms of identifying where the OSCE is going. He again expressed the support of the Assembly for convening an OSCE summit meeting in 2010 to help reinvigorate the Organization.